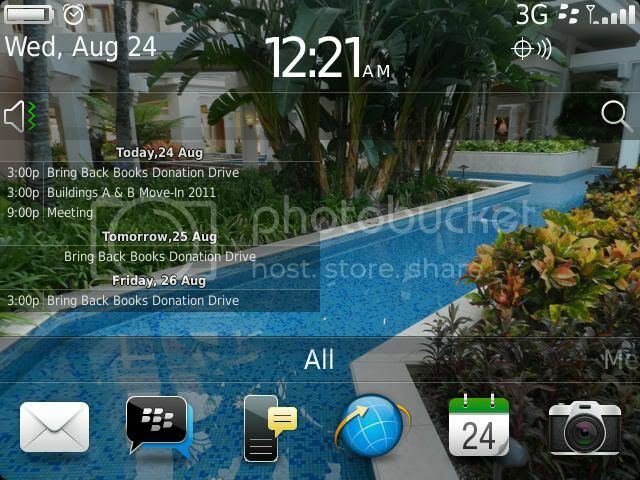 BlackBerry Bold 9900/9930 (BB OS 7) Themes Available Yet?! Correct...It installed cleanly, but nothing shows on my homescreen. It's like it's working, but nothing is visible. Hey..Olblueyez..what are you doing in this thread if you're not a 99xx owner ? i can't get fancy widgets to work on the my bold 9930...any one experience the same problem? Is there any way to do a theme without an actual theme builder app? Imagining something involving packaging a bunch of files, editing some XML, etc.? Reason I'm asking: I know there's one 'BB7' theme by RIM themselves on the phone. If it were possible to pry it off the phone maybe the theme could be reverse-engineered. If anyone has a clue on how to extract that stock theme off the phone I'd be more than happy to give it a go. Anyone know if this is a possibility or am I just talking crap? I love my new BlackBerry Bold 9900, but having come off an Samsung Galaxy S2, iPhone 4 and BlackBerry Bold 9800/9700/9000 (in that reverse order), I've missed my custom themes that allow for a nice, minimalistic look around the idea of having a gorgeous screen and wallpaper. I'll even pay premium for a Reverie 9900 version (I don't usually pay, and only as long as it works just as it did before!)! The TODAY theme is the single most important "feature" that the Blackberry has for most super busy task driven jobs like sales pro's to soccer moms. Although I love my 9930, until a Today theme comes out, it's just not as effective. If you are a user, than you already know why. Yes, you can tap the bar under the time, but that still requires a proactive gesture. Having your next 3 calendar appointments and new emails in your face without any action needed, is still the best. I can't wait for this to come out. Iif they could just take the stock BB interface where you can press to see your calender entries and allow the user to make it "stick", all they'd have to do is come out with a OS update and you wouldn't even need a 3rd party app! We all went through the same machinations when OS6 was released and there was no Theme Studio immediately available. No, there is no way to build a theme for OS7 until that software is released. One can spend a long time learning about how to reverse-engineer cod files, but we are talking about one of the strongest handheld devices produced after all. I fully intend to produce an OS7 version of my leebo theme just as soon as I have a new Theme Studio to work with. I haven't decided how I'll be distributing it this time around. For those concerned about a today screen and themes. Here is the closest you will get until the Theme Builder is released and quite honestly, for most this will solve ALL of your problems! I found that Fancy Widgets WORKS for OS7 with the latest beta! You can add sticky notes, changing wallpapers, your today screen, berryweather, stocks, memory statistics and MUCH MORE to your homescreen!!! Heres a screenshot of my set-up. I have it set for 1 week and to show 5 appointments. (You can have it show more, or less as well as change the position of the widget on the screen and edit the size)!! Good find. This may be just what I'm looking for. Just downloaded from appworld. I'm still playing around with setting but can't get the clean look you have in screen shot. What font and size are you using? How do you get it to show the wallpaper in the background? All I get isva black background??? Tap on Add Widget and add wallpaper. Then the wallpaper will be in background. Even better, why are people moaning about themes for a phone that is not even completely out yet? Thanks for recommending this. I have a new phone number as well as a new BBM PIN obviously so being able to put these discreetly on my homescreen is very handy. Ditto, hence, there isn't a sub forum for the 9900 / 9930 themes or any OS 7 device for that matter. Just like the days of OS 6, it took a while till themes started appearing. By the time OS 7 compatible themes and apps start appearing, QNX OS phones will be here!!!! Hey RIM , just release whatever it is you need to release so we can start getting some themes!!! sometimes my phone decides to just disconnect the data service on its own . The screen shows full reception and 3G , the phone still works for calls though . I've had to restart Mobile Network a few times . Anyone faced the same ? patiently waiting on themes and apps for my 9930.
me too! Theme builder, release! Any of the "pezzonovante" know any updates on when that software could drop?